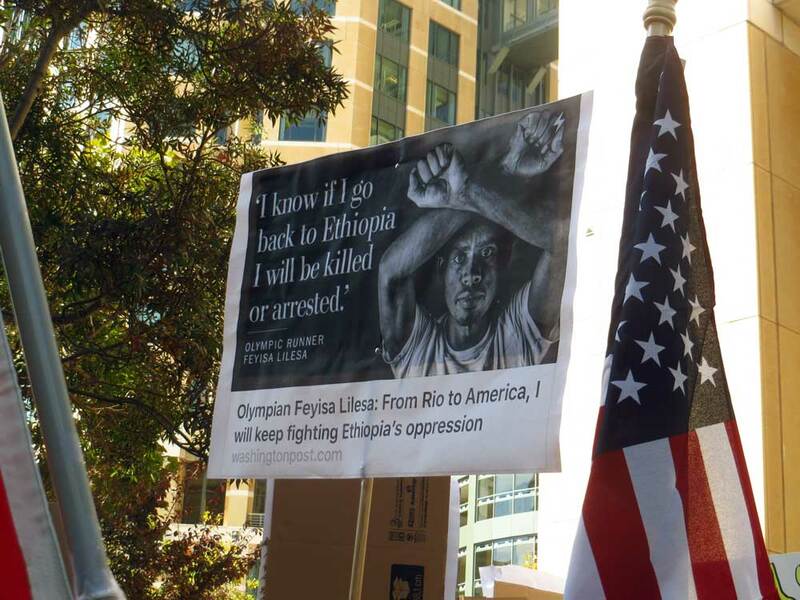 A poster of Olympic silver medallist Feyisa Lilesa at a protest in Oakland, California. Making the crossed arm gesture is now a criminal offense under Ethiopia’s state of emergency. Credit: Elizabeth Fraser. The protests that brought this unprecedented attention to the country were rooted in land grabs. Starting in November 2015, Ethiopians took to the streets to oppose a “Master Plan” to expand the borders of Ethiopia’s capital, Addis Ababa, which would have displaced Oromian farmers from their homes and land. The plan was eventually canceled, but the protests struck a nerve and became more widespread, calling for human rights and democracy in the country. After failed attempts to quell the increasing dissent with force, the Ethiopian government imposed a country-wide state of emergency in October 2016. Since then, the news out of Ethiopia has waned, but problems remain. In late July 2016, as protests spread from Oromia to the Amhara region, the country’s two largest ethnic groups – who together make up over 60 percent of the population – joined together. Despite being faced with violence from the security forces, citizens refused to back down and took to innovative means, like shaving their heads in solidarity with political prisoner Bekele Gerba and launching city-wide stay-at-home protests. In August, when Olympic silver medallist Feyisa Lilesa crossed his hands above his head in solidarity with the protests as he crossed the finish line at the Rio Olympics, the plight of his people was brought to the TV screens of millions around the world. And in October, the political situation in Ethiopia further unravelled as dozens if not hundreds were killed at an annual Irreechaa celebration in Oromia, when the police response to protests triggered a stampede. To curb this mounting dissent, a state of emergency was imposed in October 2016, including a long list of draconian measures curtailing freedoms across the country. Security forces were given greater powers, social media and diaspora news outlets were banned, curfews and travel restrictions were imposed, and more. Over 26,000 people were arrested, most of whom were sent to “rehabilitation camps,” where detainees reportedly endured physical violence, degrading conditions, and were forced to take part in a training program to ensure allegiance to the ruling party. In March 2017, while some of the restrictions were lifted, the state of emergency was extended for another four months. Hundreds, if not more, lost their lives to Ethiopia’s security forces during last year’s protests, causing international human rights experts and civil societyorganizations to call for an international investigation. The government has rejected these calls, claiming that the investigation should be led by national institutions. Several observers have challenged these findings and question the EHRC’s independence. The Commission is both funded and overseen by the parliament and is led by Dr. Addisu Gebregziabher, who took the appointment after finishing his term as deputy chairman of the National Electoral Board of Ethiopia – the agency under which the current government won 100 percent of the seats in parliament in the last election. A few weeks after the EHRC’s oral report was heard, UN High Commissioner for Human Rights Zeid Ra’ad Al Hussein traveled to Ethiopia where he met with numerous government officials, as well as political prisoners at the notorious Kilinto jail. In a press conference, High Commissioner Zeid brought attention to several issues plaguing Ethiopia, including the need for more “substantive, stable and open democratic space.” Zeid also noted that laws such as the Anti-Terrorism and Charities of Societies Proclamations are not aligned with international legal norms. High Commissioner Zeid did not, however, corroborate the EHRC’s findings, as his delegation was not granted permission to travel to areas affected by recent protests. Calls for an international investigation thus remain. While the state of emergency may have taken Ethiopia out of the international spotlight, it has failed to address the issues that fueled protests. Political dissent continues to be a criminal offense. For instance, in a “further blow to press freedom in the country,” the editor of the newspaper Negere Ethiopia, Getachew Shifteraw, was sentenced to 18 months in prison for “inciting subversion.” Yonatan Tesfaye – the former spokesperson for the opposition “Blue Party” – was found guilty of encouraging “terrorism” because of his Facebook posts and sentenced to six-and-a-half years in prison. And indigenous land rights defender, Mr. Okello Akway Ochalla, is serving a nine-year sentence for speaking out about human rights abuses in his home region of Gambella. Opposition party members likewise continue to be detained. Bekele Gerba, deputy chairman of the Oromo Federalist Congress (OFC) has been in jail since December 2015. The evidence used against Gerba includes a video in which he advocates for non-violent struggle. Merera Gudina, the chairman of the OFC, was arrested after returning from a trip to Brussels in November 2016, where he spoke to the European parliament about the current state of emergency. The government’s second Growth and Transformation Plan (GTP II) continues to advocate for foreign investment in large-scale commercial farming operations, which raises concerns about further land grabbing, forced displacement, and loss of livelihoods. At the same time, the international community has been complacent about ongoing crisis in Ethiopia. Sure, after the state of emergency was enacted, visits by some foreign dignitaries took place, including calls for democracy and fundamental freedoms. And yes, the EU recently passed a resolution on the situation in the country. But Ethiopia continues to be celebrated for its economic growth and enjoys extensive financial backing from Western and non-Western donors alike. This includes billions of dollars in multilateral and bilateral funding, as well as significant foreign investments from countries like India and China. While millions of Ethiopians continue to be denied basic human rights, this international support sends the message that the Ethiopian government can continue its crack down on democracy and people without consequences. International complacency towards the regime may well stem from concerns around maintaining stability in an unstable region. But this short-sighted approach ignores the fact that continued repression could lead to more loss of lives and a region spiralling out of control. ← Why we love, why we cheat; love & technology: How much does science know about love?